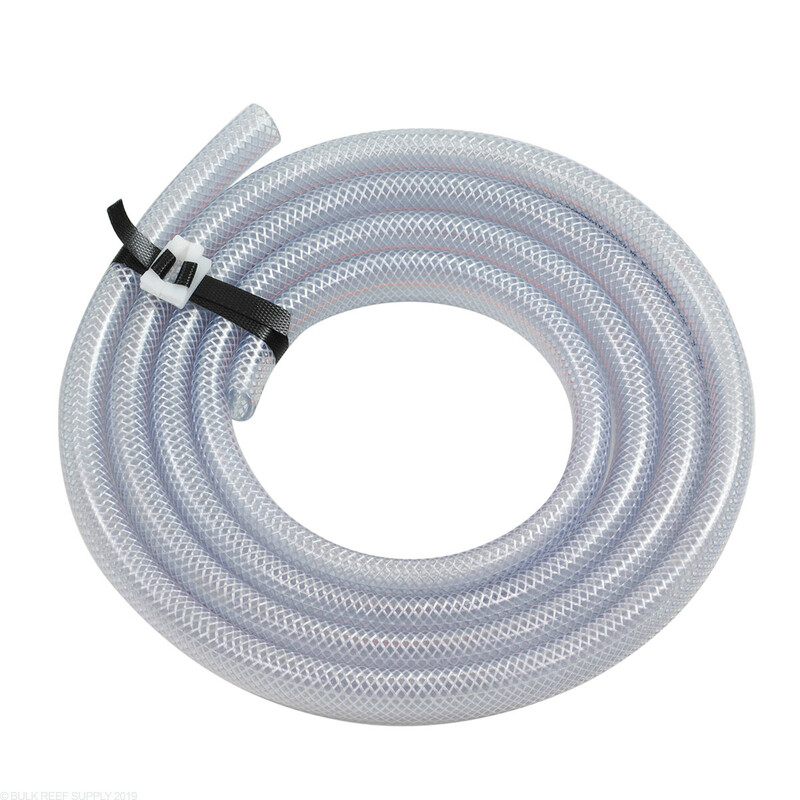 Reinforced braided vinyl tube is far superior to normal vinyl tubing because it seals better on barbed fittings and is extremely kink resistant. Very popular for the saltwater aquarium hobbyists. 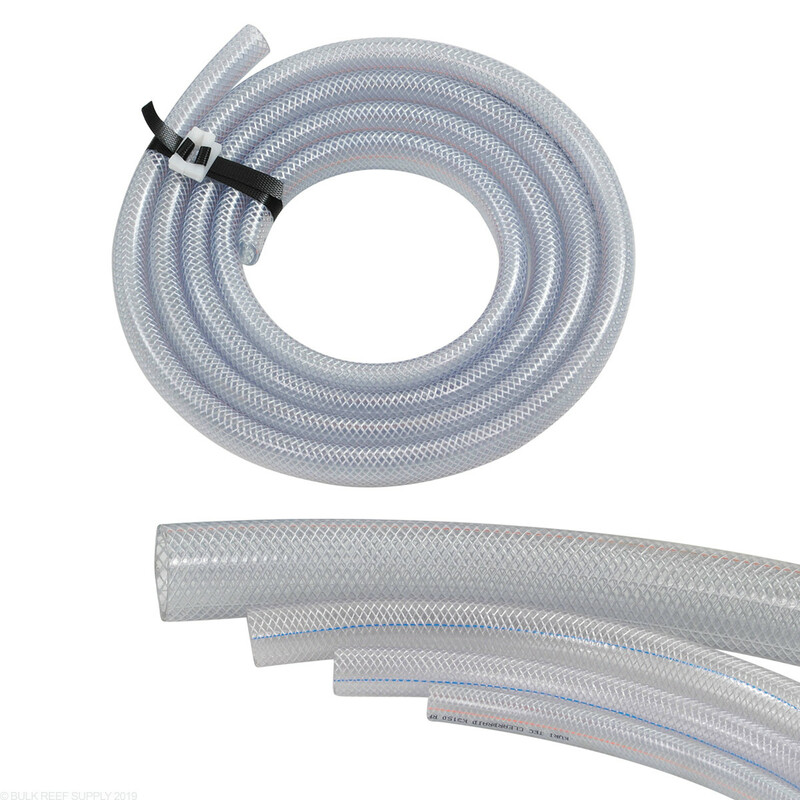 Braided Vinyl Tubing is sold by the foot. Just put in how many feet you need and we will send you a single piece that long. The hose is fine, good quality, but they wrapped tight and tied it with tyraps so there were kinks in the bends and kinks where the traps were. 6 kinks in a four foot section. I stretched it over a broom handle for a week and left it in the sun and went on vacation. When I installed it today it still had kinks. I am looking for a better solution. The reason I buy reinforced hose is so it won't kink. Need more training for the packing and shipping department.. I need to replace these hoses. After about 6 months there is nasty algae growth since light penetrates them....and they're under the tank in the sump! Nastiness involved with these! When I turn the pumps off and on again, all kinds of white matter blast through my tank from the inside of these. never again. The product has thick walls and is strong. In fact, it took a bit of work to cut it to my required length. My only negative point, and it's actually not so much a complaint as an observation that may be of interest to some is that the walls are thick, which makes the tubing a bit rigid. On the 3/4" tubing, it's hard to make a sharp bend (under 6" radius roughly) without compressing the hose a bit. Sounded good to the masses so I jumped on the bandwagon. In my next build- no way. Cons: light penetrates the inside and grows algae and slows flow/ ends harden and expand slightly in saltwater/ overkill for a reef plumbing system/ difficult to cut and work with. Replaced my standard PVC tubing with this to eliminate kinks and collapsing of the tubing that restricted flow to my media reactors. Works much better now. So I bought some of the 3/4" and 1" for various purposes. I use the 3/4" and a Sicce pump to do water changes and pump it 15 feet to a drain. I use the 1" for a return hose connected to my Vectra M1 It doesn't kink as easily as normal vinyl tubing and feels much more secure when connected to my return. It's worth the extra money. This tube is exactly what I wanted. Bought some at HD (another hardware store) and it was wrapped up so tight it was kinked. Very stiff could not straighten even with hot water. 12 feet from BRS and it came quick cost less and is very flexible and packaged without any kinks. This stuff is just the ticket for me! Don't hesitate buy as much as you need assuming they have enough ;). Very stiff and tight around barb fitting. have to really work to get it over the barbs which makes me very comfortable it will not be coming off. This tubing is very strong. It comes wound up but after a decent amount of use it will unravel (I've also heard warming the tube makes it easy to shape). 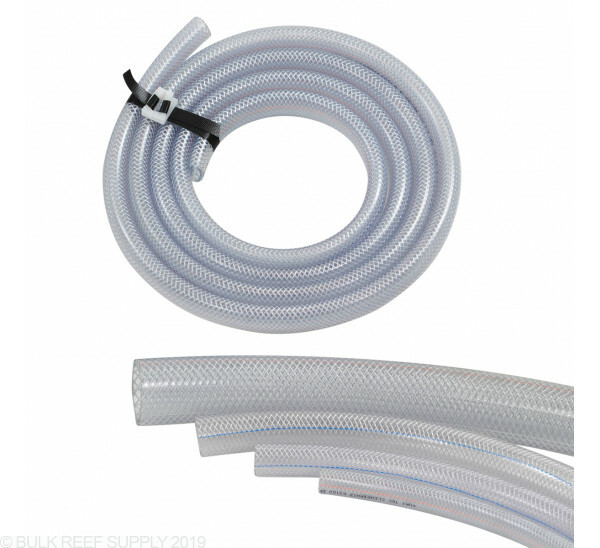 I use this tubing for water changes and would order it in the future for sure. Is really hard to kink, and comes at a great price. This stuff is high grade, durable, and well constructed. Best hose for the price! I will never buy hose anywhere else again! 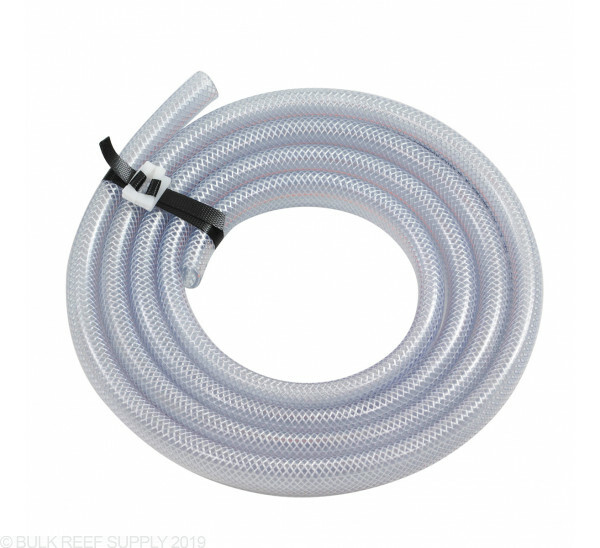 Does this come by the foot like if I order 5 feet of 3/4 tubing do I have to buy connecters or it all comes in one? and will this fit a bulkhead? Unless you order more then a whole roll (generally over 100 feet) it will come as a single piece. Tubing shouldn't be connected directly a bulkhead, you need to use a barb fitting for the tubing but that is quiet simple. If you have a 1" bulkhead you will want a 1" barb (also called "insert") fitting. Just be sure to get a slip or thread fitting depending on what your bulkhead is. I am interested in braided vinyl tubing. I need a 15 ft length of 2" ID. How to order? Website is a little confusing. If I indicate 15 on the order will I get 15 single 1 ft pieces or a single 15ft piece? These will ship out in a single length of 15 foot tubing if you select 15 as quantity. Feel free to let us know if you have any further questions! Hi, I'd like to add a spears gate valve on my overflow as part of a herbie design. Right now the overflow from the tank to the sump is a 1.25" ID corrugated flex tube. Is there anyway I can add a gate vale without hard piping it? I would connect the gate valve directly to the bulkhead and then run the flexible tube from there. I have never run a Herbie with a flexible line before so I am not entirely sure how it will work. As long as the end of the drain line is below the surface of the water it should work the same as with PVC. The other option would be to use barbed fittings on the flexible line and splicing the valve into the line but I would be concerned about leaks and the fact that if any air get into the line the Herbie will not work properly. Unfortunately, we do not sell 1 1/4" fittings so you would need to either convert your plumbing to 1" or 1 1/2" or you will need to find fittings that convert 1" or 1 1/2" threads to 1 1/4" barbed fittings. Will the 1 1/2 inch braided Vinyl Tubing fit over the barbs on the 1 1/2” Schedule 80 Straight Barb x Male Thread fitting? That is correct, 1.5" braided vinyl tubing goes with the 1.5" barb. I would also pick up a 1.5" ratchet clamp to hold it together as well.